Article first published as Interview: Carole P. Roman, Author of ‘A Flag for the Flying Dragon’on Blogcritics. Carole P. Roman started writing as a dare from one of her sons. Using an imaginary game she played with her grandson as a base, she created her award winning Captain No Beard series. Her non-fiction series about culture around the world, “If You Were Me and Lived in…” has also won multiple awards. Writing for children has opened up a whole new world for Carole even though she is still active in her family business. She is now able to share her sense of humor and love for history and culture with the audience she adores. Carole: Thank you for inviting me. I have been doing research for my newest culture book, “If You Were Me and Lived in…Italy.” “A Flag for the Flying Dragon” is a celebration of having siblings and finding a connection with them. Susan: What inspired Captain No Beard to find an official flag for the Flying Dragon? Carole: My daughter-in-law asked me to write something that would include our newest baby in the family. I had introduced Zachary, Hallie’s brother, in “Fribbet the Frog and the Tadpoles,” but he was an infant in a blanket. Jen, his mom, asked if I would do something with him as a toddler and we could see how Bonnie Lemaire would illustrate him. Bonnie has never seen the children and we have been thrilled with her depictions. Susan: Will you tell us a little bit about Zachary, and how he came to be on the Flying Dragon? He appears to be quite young on the book cover. Is he the youngest crew member? Carole: Zachary was born last July. I never planned any of the books when I started the series, and even the idea of it was… well, unplanned. I wrote “An Imaginary Tale of a Pirate’s Life” based on a game I played with three year old Alexander. Hallie was a few months old, but I made both children older because I wanted to include everybody. When the first book was named as one of Kirkus Best 2012, I wrote the second and third book, creating a series. Soon, my older daughter-in-law was pregnant again and I wrote “Strangers on the High Seas” to introduce Cayla, my youngest granddaughter. Several other books followed, based on my playtime with all the children. As soon as my younger son told me they were expecting a baby, I wrote Fribbet the Frog and the Tadpoles to welcome him to our crew. I left the last page blank until Zachary made his appearance and introduced himself to us. Susan: How did the rest of the crew feel about Zachary’s arrival? Carole: Alexander was thrilled to be adding another boy to the crew. Hallie was four years old and bewildered by so many changes, however, she took it with great first mate gusto and is a wonderful older sister. She is very protective of him, and a terrific playmate. Cayla adores Baby Zach, as he is called on our ship. 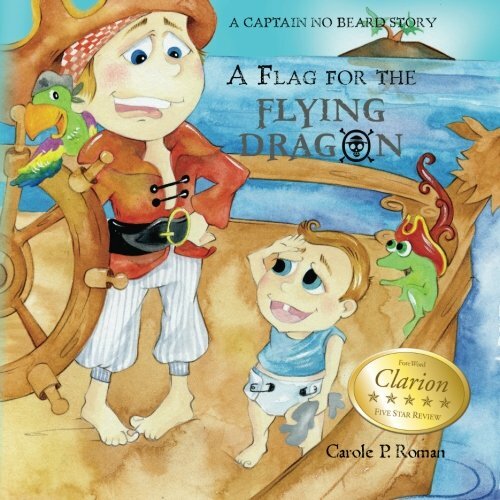 Susan: As in all the Captain No Beard stories, there is an important lesson in “A Flag for the Flying Dragon.” What lesson can our young readers take away from this book? Carole: We live in a high pressure environment that places great stress on youngsters for perfection. Between the internet and computers, immediate gratification has become the norm. We have raised higher standards for everything from sports to school work, and as a result, children’s expectations have risen to sometimes impossible proportions. My aim with the book was two- fold, first to show that despite different age groups and genders, children can play together. Everybody can have an important role to participate. When I was younger, we all played in a large group, no matter what age a person was, and had a wonderful time. We were able to dial it up or down to accommodate our playmates, showing how fun flexibility can be. We learned patience as well as toleration of limitations. That brings me to my second lesson, that of being content even when things don’t turn out exactly as we planned. I have seen children struggle with disappointment with such a degree that frustration levels rise, creating drama. Spontaneity is not only fun, it can turn out to be a delightful surprise. If children lose the ability to problem solve and work out difference, coping as adults will be a challenge. Susan: Does your grandson continue to take an interest in what you write about? I understand you wrote a book together. What a wonderful way to bond and create memories! Carole: Every time I babysit, he comes out of his room dressed in his Captain No Beard shirt (he wears it as a pajama top). He does it because he knows how it tickles me. He has come to several of my events and is very helpful. He is seven now, and I have learned how to play Super Mario Cart. We gaze at stars, and watch the caterpillars in my parsley change into butterflies. He has so many new interests and I love talking to him about them. He can read the books himself now, and he does once in a while, but I suspect he’d rather hear about Blackbeard than No Beard. Every Sunday the whole family comes over and we do new projects as a group. They range in age from one year to seven. Alexander loves to draw and continues to illustrate, but his interests are much more varied now. Susan: Tell us more about your non-fiction series. There are so many countries left to visit, is there another exploration in the works? Carole: I am working on “If You Were Me and Lived in…Italy” right now. Kelsey Weirenga is illustrating it and I expect it back any day. I will do another culture book when we wrap this one up, but I haven’t chosen the country. There are so many I would like to investigate. Susan: And, how about Captain No Beard? What is next for him and the crew? Carole: I think Captain No Beard may have to do some time travel. He may want to travel back in time and find out how something like the Olympics was founded. Susan: Thank you again, Carole, for the opportunity to interview you today. Before we go, will you tell us about your website and any additional information people can learn there about the Captain No Beard series and other works? Lastly, please look up edu.buncee.com. My books are all there in an interactive program where children can do all sorts of fun project and hear me talk about what inspired me to write each series. There is my Captain No Beard series, as well as my Culture, Non-Fiction series.